Camilla in San Francisco, CA | Bull Terrier Rescue, Inc.
← Trace in Porterville, CA – ADOPTED! A Good Samaritan found Camilla, an older lab and 10 mixed puppies in an abandoned, dilapidated trailer in the country. They were all very emaciated and had multiple puncture wounds and lacerations. All but Camilla have been adopted. She is recovering nicely but still has a bit of skin infections to be resolved (she is negative for mange). Camilla is very people and dog friendly but she is not a friend of the kitties. Update: This little dumpling walks perfectly on a leash, loves car rides and is comfortable spending time in a kennel or crate. 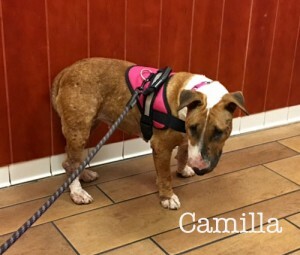 Camilla is about 4-5 years old; and she weighs around 50lbs. She is very sweet and gentle; and she is still very confused. I think that she is afraid to love again for fear of being abandoned yet another time. This entry was posted in Available Dogs, Available Females by Susi Ming. Bookmark the permalink.